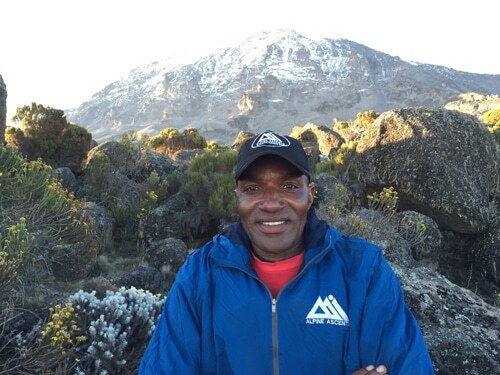 Jonas was born in the Chagga Village of Marangu, growing up with Kilimanjaro in his backyard. He has worked as a mountain guide for over 20 years. Jonas has traveled to Argentina, completing an ascent of Aconcagua, the highest mountain in the Western Hemisphere- 6963m/22,844ft. While in Argentina, Jonas also completed a professional mountaineering course for guides. Jonas is the current Chairman of the Tanzanian branch of the Explorers Club, based in New York City. He has been featured in a New York Times article by Tom Bissel. Jonas is Wilderness First Responder certified by NOLS. As a guide he is very passionate about his work enjoys very much sharing his extensive knowledge on natural history, mountain climbing and the local culture. He is the father of 4 children and lives in Arusha, Tanzania with his family. When my friends and I started planning this trip, they initially discussed other providers. I said I would not go with anyone but Alpine Ascents. During the climb, one of my friends said she was glad I had said this. Now, after two trips Alpine Ascents, I am certain no other outfitter could match the quality of the experience.